Simple ingredients magically create this make-ahead scrumptious breakfast dish fulfilling everyone’s expectations in your house. Enjoy more recipes from Holly Clegg’s cookbook, trim&TERRIFIC Too Hot in the Kitchen: Secrets to Sizzle at Any Age. Coat 13x9x2-inch baking dish with nonstick cooking spray. Spread green chilies along bottom of dish. In large nonstick skillet, cook and crumble sausage until starts to brown. Add onion and bell pepper, cooking until sausage is done and vegetables tender. Add garlic and chili powder. Remove from heat. Cool. In large bowl, whisk together eggs, egg whites, and half-and-half. In another bowl, combine green onion and cheese. Spoon one-third of sausage mixture over chilies in baking dish. Top with one-third tortilla quarters and one-third cheese mixture. Repeat layers, ending with cheese. 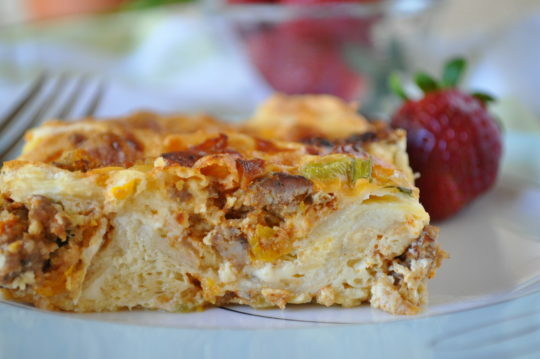 Pour egg mixture evenly over casserole and refrigerate, covered, at least 6 hours or overnight. Preheat oven 350°F. If using glass baking dish, place in cold oven and bake 50-60 minutes or until bubbly and golden brown and knife inserted into custard comes out clean.